I wrote this post after our media trip that was hosted by Visit Ann Arbor and The Graduate Hotels. All suggestions and endorsements are solely personal. Our policy is to only share and recommend what we personally like and experience. 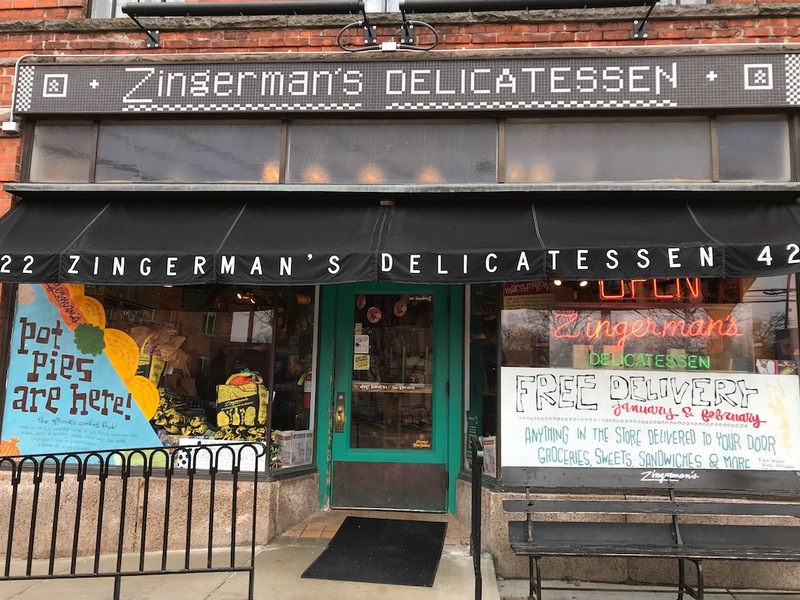 When you venture on any road trip in Michigan people always say, “Don’t miss Zingerman’s Deli!” I have to be honest and although we’ve driven many, many miles in the mitten state Zingerman’s and Ann Arbor had not previously been on our route. This changed when we decided to visit the home of the University of Michigan’s Big House earlier this year. 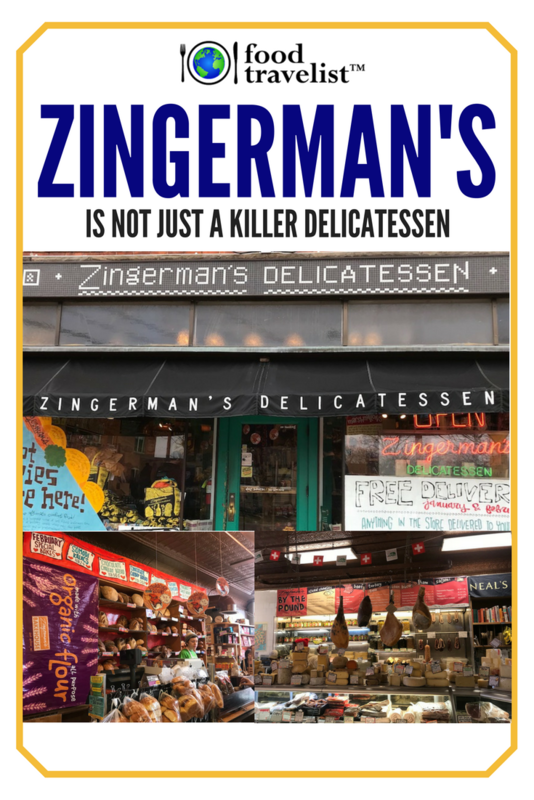 As we began planning our trip we knew a stop at Zingerman’s Delicatessen would be a must. Little did we know that there’s a whole lot more to Zingerman’s than we could possibly imagine. It all started as a deli offering authentic great-tasting Jewish dishes. Little did Paul Saginaw and Ari Weinzweig know that it would turn into a business model that companies around the world would want to learn about and emulate. 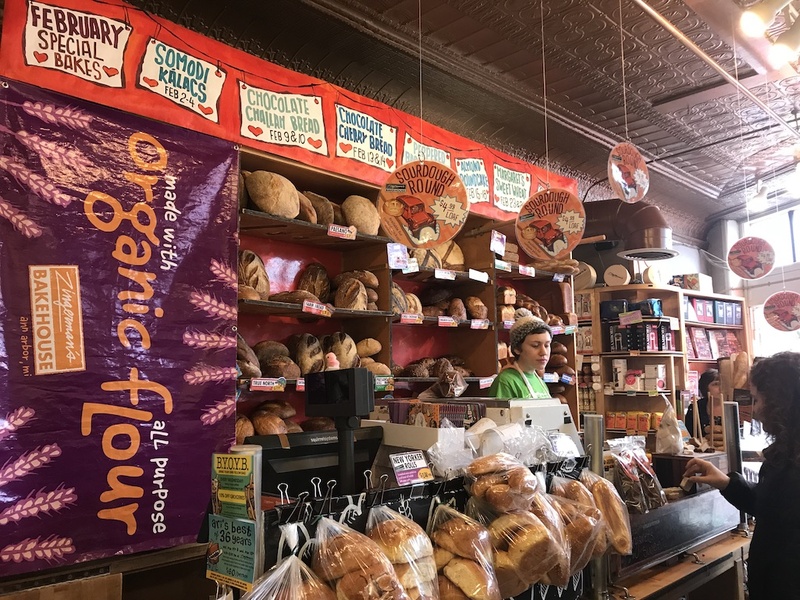 Zingerman’s deli is world renown but most people may not know that Zingerman’s also operates what I’d like to call “Zingerman’s World” or more shops that are in the Zingerman’s Community of Businesses just on the outskirts of Ann Arbor. It’s only a ten-minute drive from downtown Ann Arbor but this tasty destination just might have you staying all day. If you’re going to be in the area for a few days it might be best to break up your Zingerman’s “experience” into two days. 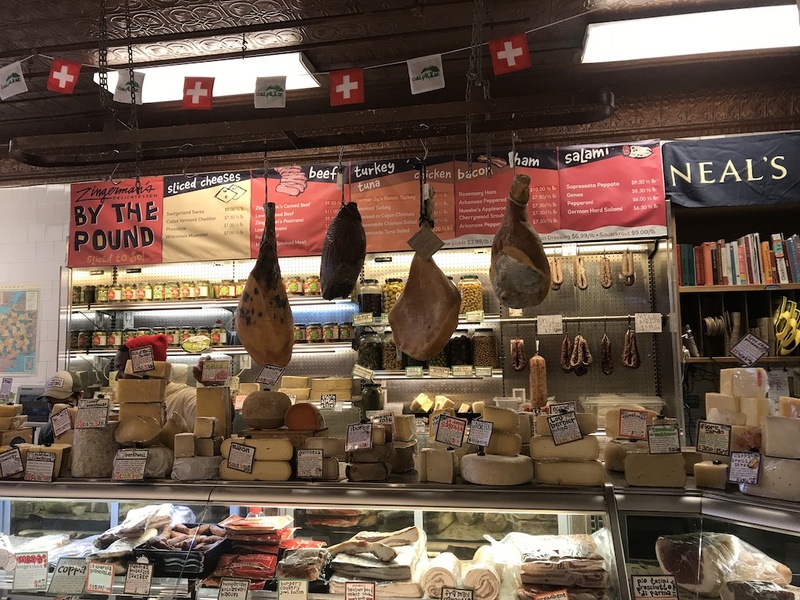 Spend one morning at Zingerman’s World and take some time on another day to enjoy the deli. 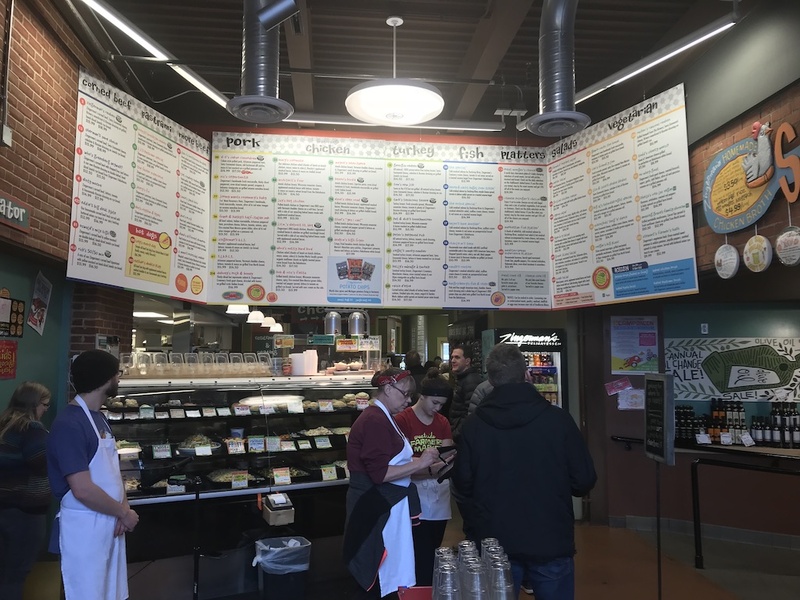 When you arrive at the Zingerman’s outpost you’ll need to plan your strategy on how to taste your way through each and every store. 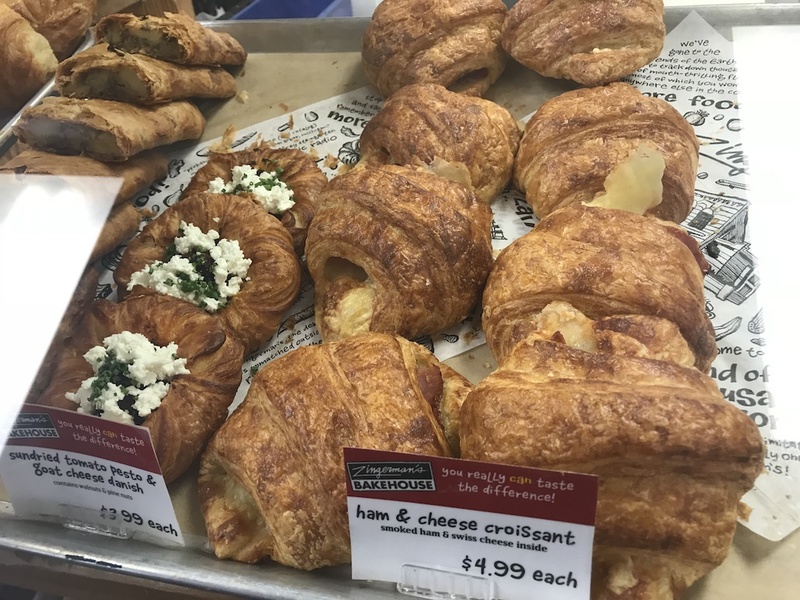 This location has a bakery, a creamery that features cheeses and gelatos, coffee bar and a candy shop. All these stores are right next to each other in what I would describe best as an industrial park. Don’t let this stop you from going. The first time we visited we were certain we had gone the wrong way. Then we saw all the cars and knew we had arrived. Since we arrived early in the morning we started with Zingerman’s Bakehouse. It opens at 7 am. The intoxicating smells of so many loaves of bread and fresh baked goods will entice you to stay and oogle everything. They have a list of what bread comes out at what time and believe me the locals know this schedule. 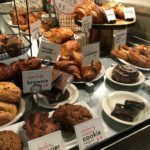 We tried several cookies, breads and pastries, but my all time favorite was one of their specialty loaves – chocolate cherry bread. I’m still hoarding half a loaf in the freezer and take out a slice (or two) for a toasted treat. 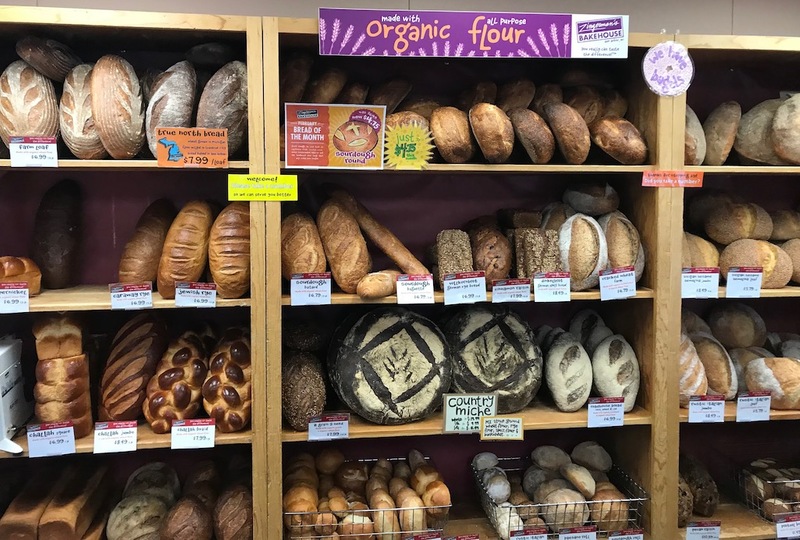 Zingerman’s really prides itself on using the best ingredients, many of them local. This particular bread is made with Belgian and French chocolates and is loaded with Michigan dried cherries. When toasted the chocolate becomes an ooey-gooey delight. Since we had a bag loaded with treats we thought we’d make our way to the coffee shop. 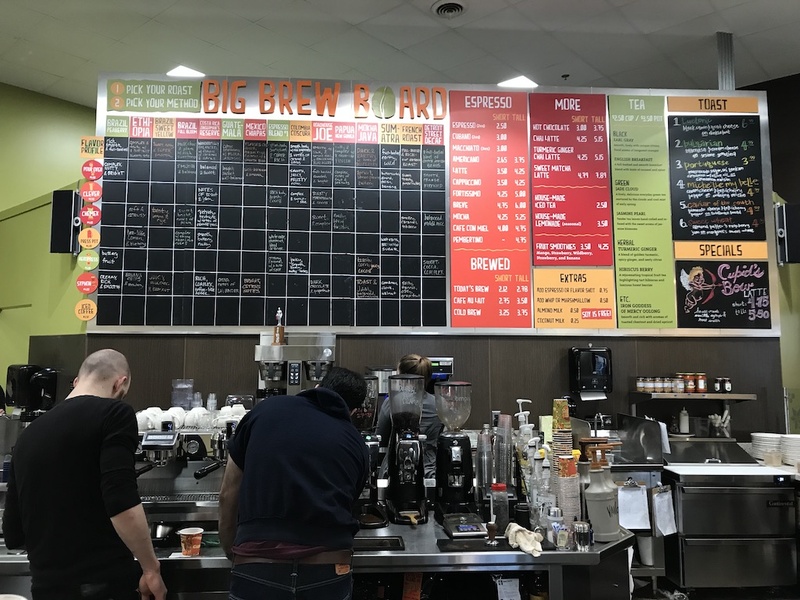 When you enter you will be blown away by the choices that are in front of you on what they call the “Big Brew Board.” Although there’s a lot to take in they do make it fairly easy to identify which coffee would best suit your taste. I was happy to see a large selection of Rishi Teas from our friends in Milwaukee. Since I’m not a coffee drinker I was pleased to see that they chose a wonderful tea partner. They also have a limited food menu that will also have your head spinning. They have a “toast menu,” which has much, much more than the overdone avocado toast. Don’t miss the Portuguese Toast if it’s on the menu. When I say that service is a bit slow I have to add that you won’t mind. The gal that was preparing our toast let us know that it would be awhile. 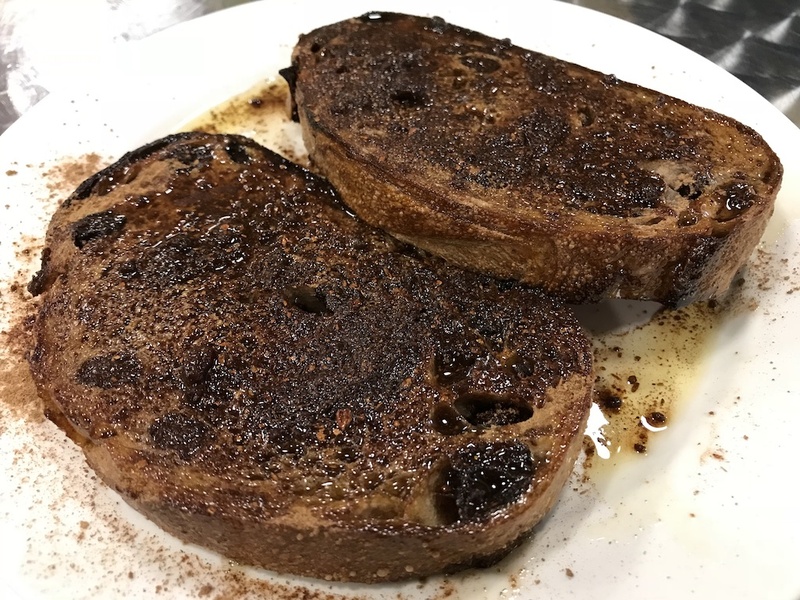 The sweet mix they sprinkle on the top of the toast, of Muscovado sugar, Sri Lankan cinnamon from Epices de Cru, and Indonesian Korintje cinnamon, was not as “fresh” as she would like. So she made a new batch. Seriously. Our cinnamon raisin bread was toasted and drizzled with extra virgin olive oil from California Olive Ranch. She also ended up giving us an extra piece for our trouble. This was simply the best toast we’ve ever eaten. It was gone in seconds. Next to the bakery is a space for hands-on cooking classes. We didn’t have the time to take one and boy were we sad we didn’t. The classes we observed were small and looked like a lot of fun. One of their best known “classes” is actually a camp. Camp Bacon is a five-day celebration of everyone’s favorite meat. 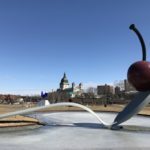 This year It includes bacon baking classes, a bacon ball hosted by James Beard Award-winning chef Rick Bayless, a bacon street fair and the Main Event, an all day bacon extravaganza. 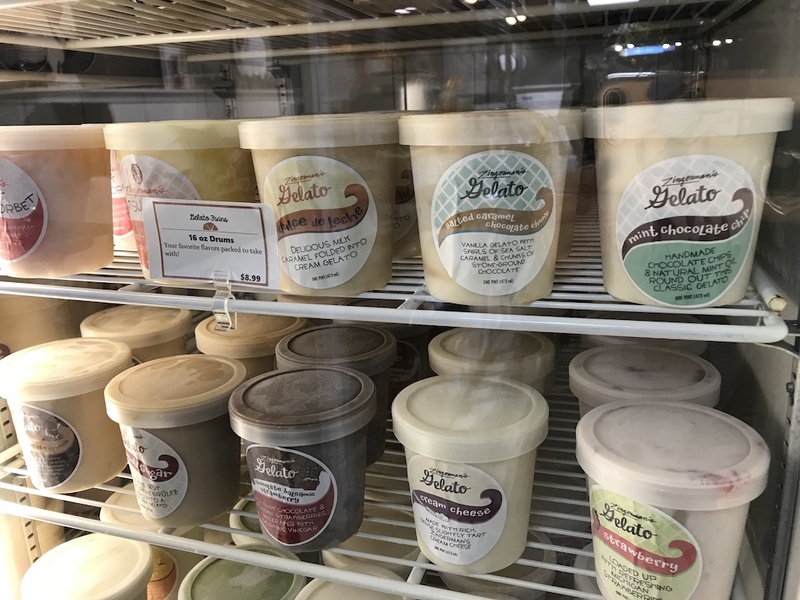 When their website says “we are dedicated to crafting handmade full-flavored CHEESES and GELATO using traditional methods while sourcing the highest quality milk we can find from equally dedicated, small-scale regional farmers” you know they are taking this creamery seriously. You can watch the production going on behind the storefront and witness their dedication to producing premium products. They not only produce cheese but also have a very well curated selection of cheeses from around the world. Don’t miss the gelato and sorbets as well. 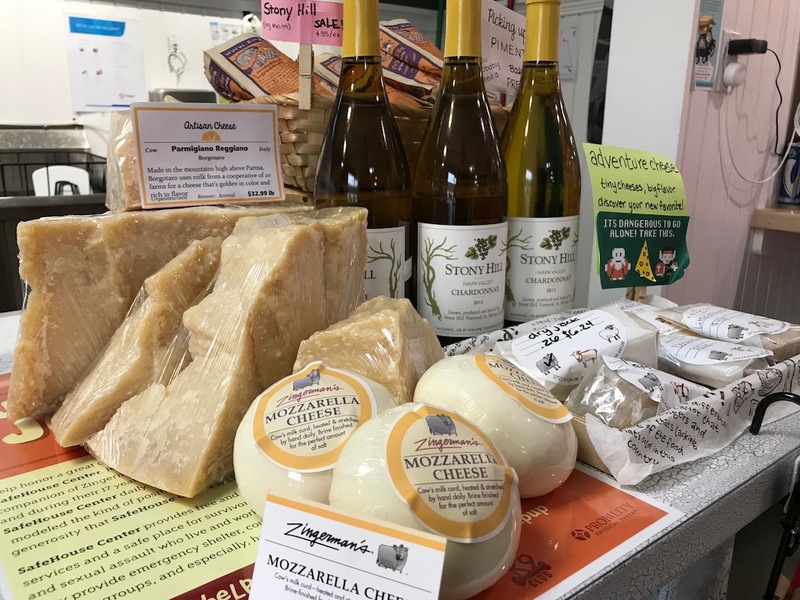 This is a shop that’s perfect for picking unique items for your next cheese board or picnic basket. Our last stop on the Zingerman’s boardwalk was their Candy Manufactory. 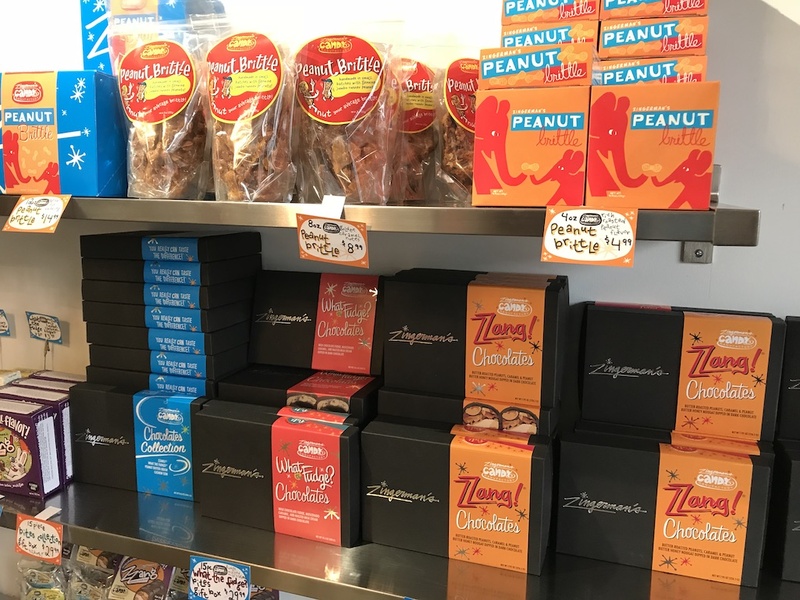 Of course, they feature their most popular items like the Zzang Original with layers of caramel, peanut butter nougat, and butter-roasted peanuts covered in dark chocolate. But there are a lot of other delicious sweet treats from which to choose. Just like the Creamery, you can see the candy makers behind the scenes hard at work. Another good thing to know is that Zingerman’s products are sold all over in Ann Arbor. Many of the local restaurants proudly use their bread and other products on their menus. Zingerman’s also has a very robust online ordering program. Most of their items are available and ready to ship anywhere in the world. We saved the Zingerman’s Deli for the next day and I’m glad we did. We visited on a Saturday and it was packed. 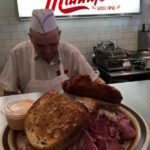 People do travel from far and wide to experience this iconic deli. 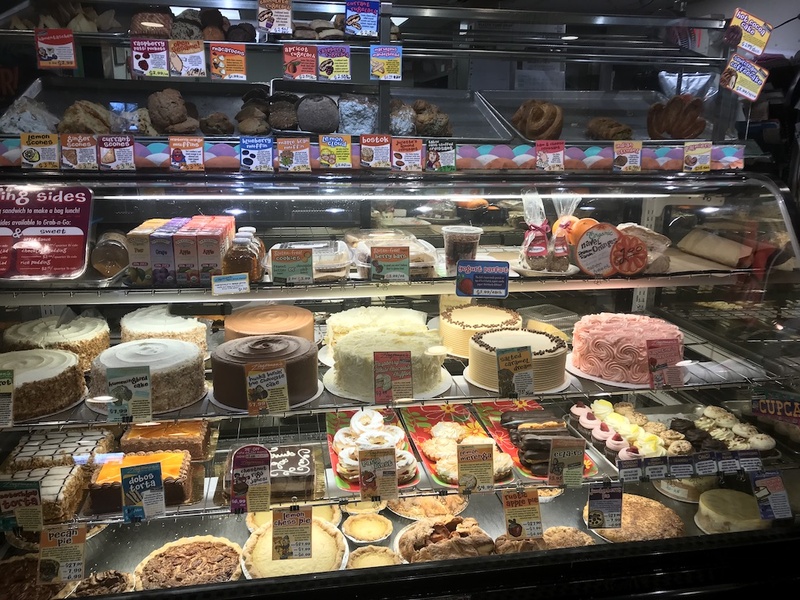 Most of the products that we saw and tasted at the other location are in fact available here at the Next Door Cafe located conveniently right next door to the deli. If you’re looking for a less crowded spot that still has many choices, head over there. They have a full selection of coffee, teas, pastries, chocolates, candy and of course, gelato. First off, be prepared. This is not your typical neighborhood deli. It’s a deli counter, a bakery counter, a gourmet store, a bookstore and a sandwich shop all in one place. If you love food you’ll want to spend time exploring and sampling. If you look at something for more than a minute some very helpful Zingerman’s employee will ask if you’d like a taste. Zingerman’s customer service is legendary. In fact so much so that they now teach other businesses how to run their customer service departments and have shared their techniques with companies around the globe. They run training classes and sell books on how to succeed in business. Another aspect of Zingerman’s that we love is their community service. 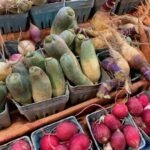 They founded Food Gatherers, a nonprofit food rescue program and food bank that helps alleviate hunger in Washtenaw County. The counter folks at Zingerman’s were very knowledgeable and ready to happily explain the differences of the many kinds of bacon and ham they carry in the cases. 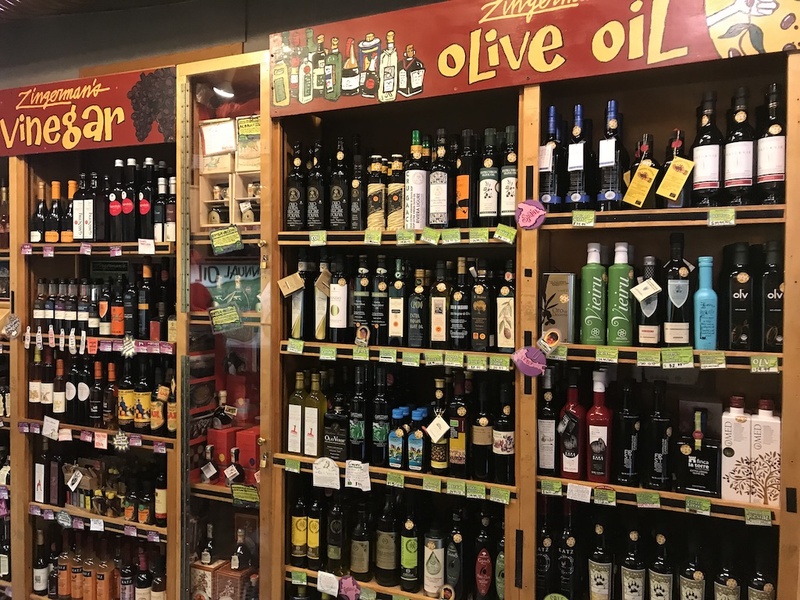 There’s also a full selection of cookbooks, olive oils, vinegar and other gourmet foods. These are wonderful to browse through as you wait in line for one of their sandwiches. If you want to order one of their world famous sandwiches and salads you might want to take a look at the menu online before you get there. Trying to choose while you’re in line is going to be a challenge. There are just too many great choices! You order by number and everyone has their own special favorite. These are not cheap sandwiches or super large sandwiches but they do feature the best ingredients around. We appreciated the all-natural, 100% preservative-free meats and authentic cheeses like this Swiss Emmental on the Georgia Rueben. Zingermans turkey sandwiches. Photo Courtesy of Zingermans. You can also choose from the very large selection of deli salads too. If you’re a pot pie lover you wouldn’t want to miss their classic chicken pot pie. 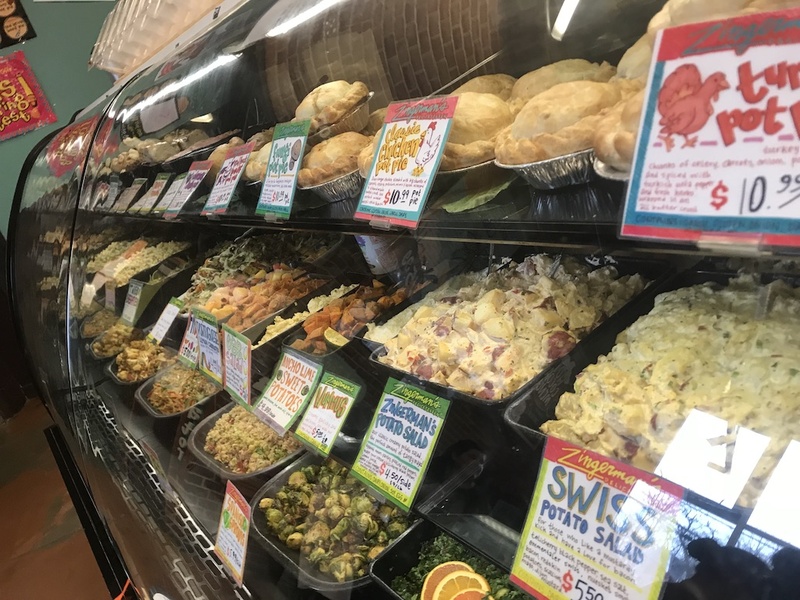 Zingerman’s also has a full catering department, if you’re looking to plan a party or special occasion. The deli location holds events and classes so be sure to check their website for the latest updates and offerings. 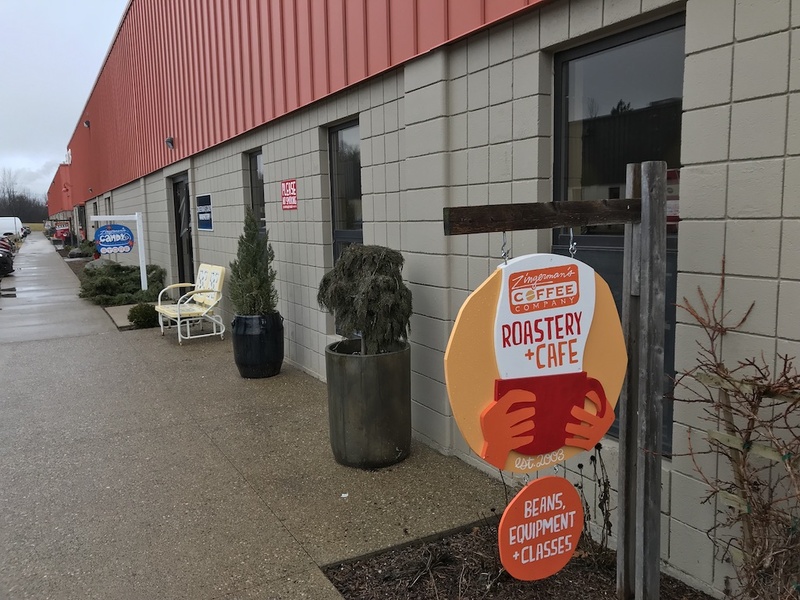 There’s also Zingerman’s Roadhouse, the seventh member of the Zingerman’s Community of Businesses, which we sadly didn’t make a stop at because there are so many other tasty spots to try in Ann Arbor. I have to tell you that just thinking about this place makes me hungry! Although this may have been our first visit to Zingerman’s it definitely won’t be the last. If you find yourself craving great deli visit Zingerman’s in Ann Arbor or check them out at Zingermansdeli.com. 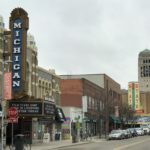 If you’re planning a trip to Ann Arbor be sure to contact our friends at VisitAnnArbor.org for information about hotels, events and all there is to know about Ann Arbor. I visited Ann Arbor many moons ago and my friend who was studying there brought me around and the first stop as soon as I got off the train was Zingerman’s Deli. That was my first time falling in love with the sandwich known as the Reuben. I didn’t realize there was a Zingerman’s World and I would’ve totally enjoyed spending my whole day there sampling every product. Hi Danial!! I hear ya. It’s a dangerous place for anyone who loves food. Thanks for stopping by. You captured it all. This is the sort of place I’d lose myself in for hours. I think I need to visit Ann Arbor, even if it’s just to experience “Zingerman’s World”. What good eating! I’m drooling over the Portuguese Toast. I love shops with some of everything! Baked goods, deli meats and chocolates! 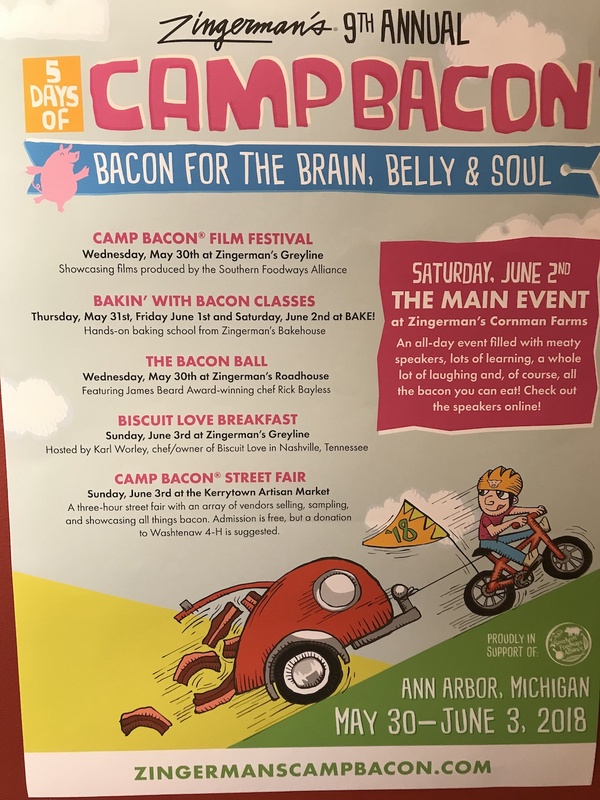 Of course Camp Bacon really caught my eye. Wow!!! Zingermans definitely looks like my kind of place! I would love to visit Ann Arbor and check it out!!! Heard so much about this Ann Arbor “institution” and would so love to visit Zingerman’s! Your post made its reputation sound even tastier! It looks like it would be easy to spend all day in Zingerman’s Deli. I’ll be checking it out next time I’m in Ann Arbor. Right now I’m salivating! OMG! We have visited Ann Arbor in the past, but somehow missed Zingerman’s Killer Deli. Looks like we will need to make plans for a return trip. Just the breads alone are tempting enough for a visit. Oh dear lord, I can see myself spending a lot of money here. I would definitely explore every inch of this deli to check out and try their products. I am sure wine and cheese lovers enjoy frequenting this place to stock up on Zingermans’ wide selection of deli meats and cheese. Ann Arbor is on our bucket list. We’ve never been but have heard so many good things. I’m going to have to add Zingerman’s to our list of places to visit when we finally make it to Ann Arbor. You will love it Bianca! Hope you get to visit Ann Arbor soon. Wow, this looks fabulous! I’d love to visit. My husband really likes delis because he grew up with amazing Italian deli options. We don’t have many here in Arizona. Oh man this looks amazing. I wish we lived closer because this is our kind of place. Great for meals but also for picking up some high quality ingredients for cooking at home. So hope we can visit one day. You totally had me at the bread but then it just kept getting better and better! This is totally my kind of place! I would love to visit Zingermans and I can see why others want to emulate it! I have never heard of Zingermans but now I am wishing I had one close by! This seems really cool. Being able to see things in production and smell fresh bread – that is my kind of deli! I will have to check one out next time I travel near one! Oh man. I love a good deli and this one looks amazing. I can’t believe that in all my visits to the area I’ve never been there. Adding it to my list for next time for sure. Yes! I live about 30 minutes away from Zingermans. I have not been there in years, but after reading your blog post, I think I am way over due for a visit. I can still remember the smell of amazing bread. I just love Ann Arbor and all that it has to offer. The summer months are full of street vendors and festivals. So much fun.